Lutron Electronics, a world leading smart lighting and home automation company, last week announced that one of their flagship wireless lighting control brands, RadioRA, was to come to Europe for the first time. 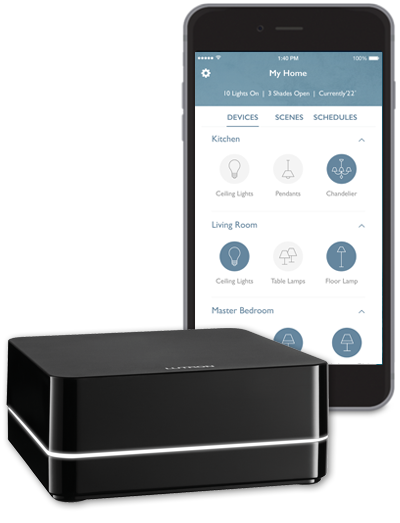 Lutron made the announcement at the recent ISE 2019 trade show, where the smart-home giant showcased the new EMEA version of Radio RA2 Select. That European version of the wireless lighting control system is described as a kinder, gentler version of Lutron’s flagship Radio RA2 model. RadioRA was first introduced by Lutron all the way back in 1997 but for the ensuing 22 years was available only in North America. Just two years after Radio RA2 was launched on the other side of the pond, however, European integrators and home owners have their own version. The European RA2 Select version of the system is simpler to install than the original RA2, with an app-based tool for enrolling and configuring Lutron’s own smart lights and shades. The system revolves around a small hub, the RA2 Select Main Repeater, which communicates with shades, switches and other smart home elements. If you would like to discuss your requirements for Lutron smart lighting control solutions please call us on 0800 195 4825.